‘Just the concept that there are organizations trying to support local fishermen|! !| no matter to what degree|! !| means a lot to us|! !|’ says Tommy Lyons|! !| a commercial groundfisherman for 20 years. New England wouldn’t be the same without the sight of fishing boats easing in and out of its working waterfronts. There is no better homage to this rich seafaring heritage than the visitors and residents alike who clamor for the region’s cod sandwiches, crisp haddock, buckets of steaming fried clams and, of course, the iconic overstuffed lobster roll. But now, the industry that for centuries shaped New England’s economic, culinary and cultural life, faces serious challenges. This is exemplified by the reality facing New Hampshire’s groundfishermen, who catch the species that dwell near the bottom of the ocean, like cod, haddock and hake. Dwindling stocks, stricter regulations and an influx of inexpensive seafood from other countries have made making a living off these species difficult, and forcing these pillars of the fishing industry to find alternative routes to market to survive. Leaving New Hampshire’s shores early in the morning in small 40-foot boats and returning in the afternoon to sell the day’s catch, groundfishermen seem to personify the state motto, “Live Free or Die.” But their numbers are shrinking. There are 10 fishermen currently working from New Hampshire ports — down from over 60 less than 10 years ago. Those who still head out everyday love their life on the water, and they are fighting to stay there. 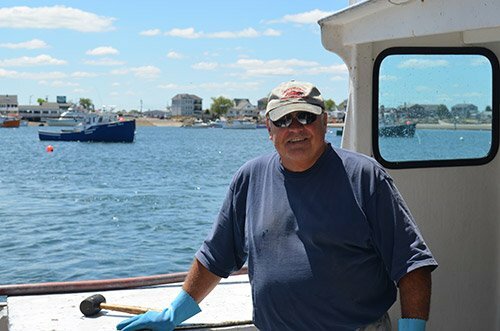 Tommy Lyons has been a commercial groundfisherman for 20 years and currently fishes out of the Yankee Fishermen’s Cooperative in Seabrook. Since 2010, he’s seen his cod quota drop from 50,000 to 2,500 pounds. To make matters worse, once he catches his quota for one species, regulations require he stop fishing for all groundfish, since the species he’s reached the quota for will likely end up in his net. As a result, his fishing opportunities are at an all-time low. The redefined logistics of catching fish is just one part of the challenge. The other is actually making a living off the limited amount caught. Fisherman Peter Kendall also manages the Yankee Fishermen’s Cooperative in Seabrook. The seafood markets that are traditionally available to New Hampshire fishermen are no longer influenced by local supply and demand, and they do not reflect the new ecological realities of fishing. Instead, haddock, cod and pollock command a price at auction that is set by the global flow of seafood. This pits New Hampshire fishermen against those harvesting similar species halfway around the world, sometimes with minimal or no regulatory oversight and often with a cost of production that is relatively minuscule. While these markets have supported fishing in the past, prices today simply do not return a living wage to fishermen and their deckhands. In communities across the country, a movement has sprouted up aimed at helping the local fishing industry create markets that deliver higher prices to fishermen for the fish they can catch. In the Granite State, there are dozens of businesses helping to get fresh seafood into the hands (and mouths) of consumers while making sure fishermen can earn a living wage that allows them to stay in business and support their families. NH Community Seafood, which delivers freshly caught seafood to 19 locations weekly, has adopted the community support agriculture model. While eliminating middlemen means consumers typically don’t pay more, it does mean that they may need to be open to trying new species. Fishermen are only able to catch what’s available and what the best available science indicates the stock can handle. For example, consumers looking to consume sustainably harvested fish in New Hampshire will likely be eating dogfish, redfish or pollock. In addition to NH Community Seafood, consumers and restaurants can purchase fish directly from two off-the-boat seafood sellers FV Rimrack in Rye and FV Vivian Mae in Portsmouth, as well as from an emerging whole fish seller, New England Fishmongers out of Eliot, Maine, and numerous local fish markets: Seaport Fish in Rye; Taylor Lobster in Eliot; Sanders Market in Portsmouth; and Yankee Fishermen’s Cooperative in Seabrook. According to Andrea Tomlinson, general manager of NH Community Seafood, the system has clear benefits for consumers too. This article is part of a collaboration between UNH Cooperative Extension and NH Business Review.